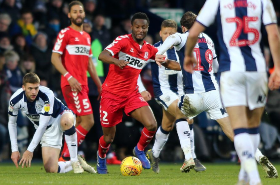 Nigeria captain John Obi Mikel made his full league debut as Middlesbrough came from behind to register a 3-2 victory over fellow promotion hopefuls West Brom at the Hawthorns on Saturday evening. Although Britt Assombalonga was the game-changer thanks to his eight-minute brace after coming off the bench, the Chelsea legend showcased his passing abilities and deft touches. On his league debut, Mikel made way for Rajiv van La Parra with fifteen minutes left on the clock. Elsewhere in the division, Nigerian-born winger Bright Osayi-Samuel scored his first league goal of the season as Queens Park Rangers suffered a 2-1 loss at the hands of Wigan Athletic at DW Stadium. The 21-year-old came off the bench at halftime with the visitors trailing 2-0 and scored from 16 yards out to half the deficit with 15 minutes left on the clock. In League One, another attack-minded player born in Nigeria, Bright Enobakhare was on target as Coventry City shared the spoils with a 1-1 draw against Gillingham at the Ricoh Arena. The Wolverhampton Wanderers loanee powered home a rebound to give the Sky Blues the lead on 68 minutes but his goal was cancelled out in the second minute of stoppage time.